I teach workshops on library databases to a range of users throughout the year at the New York Public Library. Some of the walk-in students are academics, others are unaffiliated scholars, and many more are undergraduate or graduate students from nearby schools. The degree to which they’re familiar with platforms, searching, Boolean logic, peer-review, and formats varies. But one thing all the students share is general confusion as to which database they should use for the kind of research they’re conducting. The database vendors don’t help: Readex? Never heard of it. ProQuest? Sounds vaguely familiar. And the database names—Academic Search Premier, Ulrich’s, Project Muse— are opaque. Yes, some exact titles, like The New York Times or Chicago Defender, can steer the user in a general direction, but without a greater understanding of the kind of content that can be found in each resource, the user is left to fend for his or herself. And that usually means Google. While Google is not an inherently bad choice, especially for initial research queries, many beneficial subscription resources are left unexplored. Take online reference databases—in the past, a question asked at the information desk often resulted in a librarian directing the user towards the section of the physical reference shelf where one might find sources to help. Today, much of that reference shelf has moved online to platforms like Credo or Gale Virtual Reference Library. The online sources may provide 24/7 access to information, but finding relevant titles is often more difficult. Theoretically, that’s where discovery platforms like Summon and EBSCO Discovery Service come in. Discovery platforms search the metadata of nearly all the library’s subscription resources simultaneously so users don’t need to visit each database individually. But they are only helpful if the service your library subscribes to indexes the databases that you need. EBSCO Discovery Service, for example, doesn’t index ProQuest products, and vice versa. Therefore, if you’re using EBSCO for a search on historical newspapers or periodicals, your results will be greatly limited. Perhaps it’s no surprise, then, that 97% of academic library directors surveyed in the recent Ithaka S+R survey cite teaching informational literacy to undergraduates as an important function of the library. With such limited transparency of online sources, undergraduates clearly need all the help they can get when starting their research. The Beyond Citation team hopes that researchers—both seasoned and amateur—will shine the light on databases they use regularly by examining the database’s strengths, weaknesses, and the overall range of material. In other words, the content. Because without a better understanding of the troves of rich information discoverable in each database, they’re all just links on a page. This entry was posted in Spring 2014 on March 31, 2014 by Rebecca Federman. A few weeks ago Matt Kirschenbaum spoke about Len Deighton, the British spy novelist whose Bomber (1970) is considered the first novel written on a word processor. 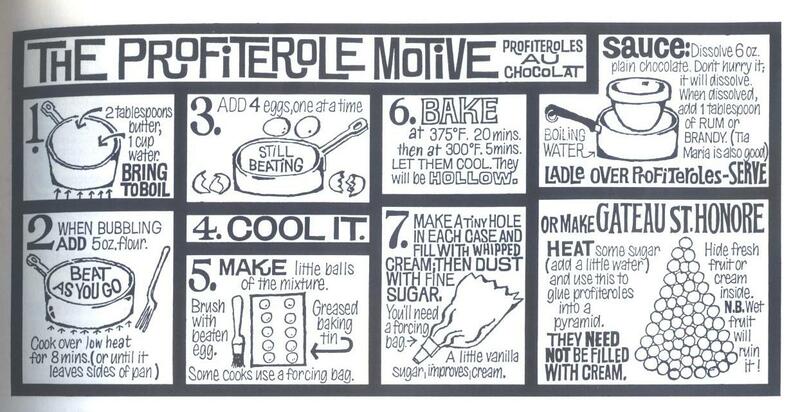 Len Deighton was also a fairly prolific cookbook author. 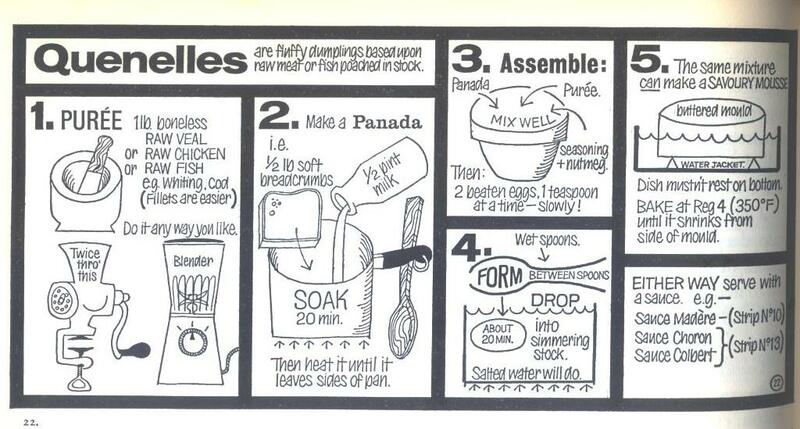 But Deighton didn’t write his cookbooks on a word processor. 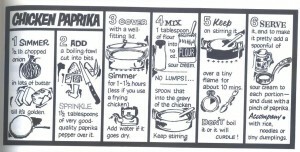 In fact, he did quite the opposite: he illustrated most of his recipes in comic strip form. 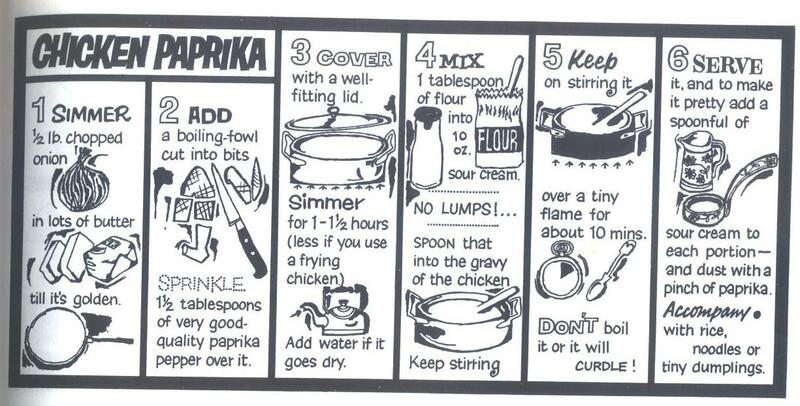 The recipes appeared in a regular column in the London Observer as “cookstrips” and then in several cookbooks throughout the sixties and seventies. 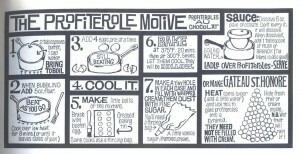 I’m a huge fan of his cookbooks and thought I’d share some of his strips here. 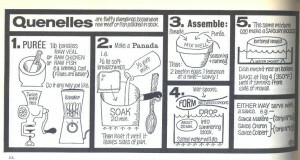 Deighton’s cookbooks also demonstrate that while he might’ve embraced technology in some areas of his work, he was open to many forms of literacy and communication. This entry was posted in Fall 2013, Uncategorized on November 14, 2013 by Rebecca Federman. Just wanted to let everyone know about a two-day program at Princeton University in October on Avant-Garde magazines and digital archives. Looks to be a fascinating discussion on how to represent these periodicals in a digital landscape — and the program is free. This entry was posted in Fall 2013, Uncategorized on September 23, 2013 by Rebecca Federman. My knowledge of DH is still so new that many definitions sound correct to me. I guess I’m less interested in a precise definition of what DH is than in learning what the philosophies and ideologies behind DH tools and projects are. For example, does Digital Humanities presume OSS ? Can a library database that uses technology to transform humanities research be considered a DH tool even if it comes from a private company? Is curation required to make something DH tool? Just some thoughts and questions…. This entry was posted in Fall 2013 and tagged DHdefinition on September 20, 2013 by Rebecca Federman.